Shock absorbers are used in many industrial applications to decelerate loads, prevent impact damage, dampen noise, increase equipment speeds and improve overall product performance. 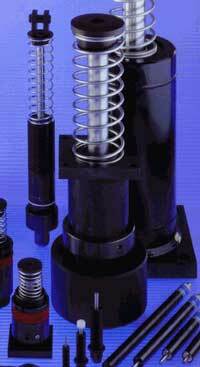 A major objective in the design of shock absorbers is to achieve a linear deceleration, and hence reduce the shock and damage to equipment and machine. The capability of the ADINA System to solve problems of fluid flow with structural interaction has been used effectively to help designers in such applications. When ACE Controls engineers were told to redesign their company's shock absorber, improve its performance by 50%, and constrain its size, they turned to software analysis. To locate the best program, 11 different FEA software vendors were contacted with a test problem. ADINA was selected! With the help of ADINA analysis tools, ACE Controls engineers designed the new Magnum shock absorber that offers up to 3.9 times the effective weight capacity and absorbs 50% more impact energy than its predecessors, without an increase in size or cost. Results from ADINA (below) show how pressure affects the bladder when wall thickness is reduced from 40 thousandths to 35 thousandths of an inch. This analysis was featured in an article "Great weight, less filling" in Design News.